I've learned a lot in 5 years. I learned HTML so that I could customize my page layout and formatting. I've learned about what friends-of-Pinch like to cook, eat, and drink. I've learned to keep fresh ginger, limes, and jalapeños stocked in my fridge; not to give up on anything that hasn't yet born fruit (I'm talking about my lemon tree, which was at death's door in October but has since flowered and has a few teeny-tiny lemons growing on it); and that "the money shot" doesn't mean what I thought it meant (it means something entirely different from "a very good photo"). 5. Poblano Beef: Best weeknight family meal when you've got poblanos and lean sirloin steak in the fridge. To celebrate Pinch's birthday I had some mugs made: the etched glass one pictured above. I can't tell you how many of you have confessed your fondess for glass mugs over the years! 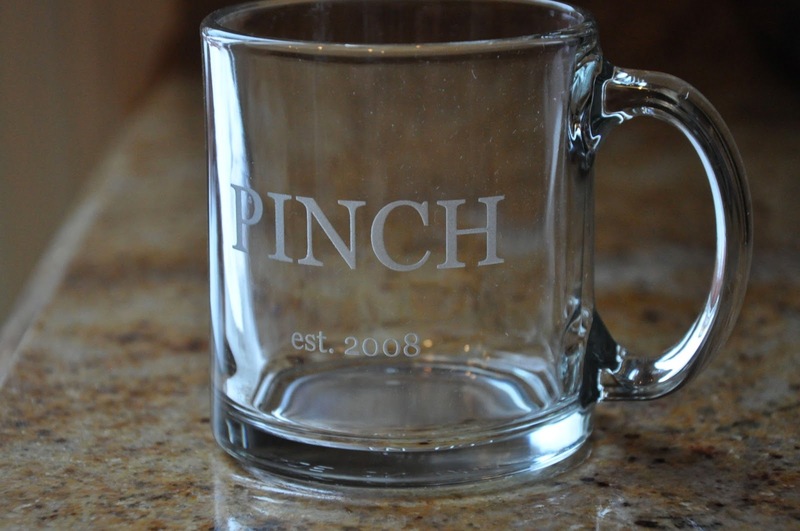 To win a Pinch mug, please send me your most Pinch-worthy recipe. The winning recipe will be healthy, family friendly, delicious, and it should be new to me. If it's not a real recipe, just something you make by heart, that's fine, just describe it for me. The winning recipe will be posted on Pinch and added to the Recipes page and the author will receive a Pinch mug and a package of Pinch granola (made with nuts in a nuthouse). Email your submissions to Pinchfood[at]gmail[dot]com by 11:59PM Pacific tomorrow, March 1 and I'll announce the winner on March 2. Good luck! I've been making these silly things once or twice a year for like 10 years. 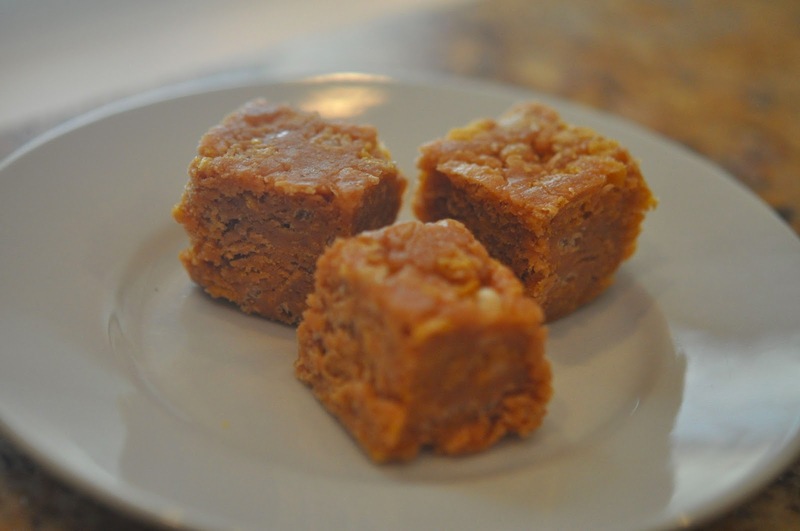 It's basically a food-based rice crispy treat, made with peanut butter (the food part), sugar (the treat part) and a combination of crispy rice and corn flakes (the crispy part). Essentially, it's like making your own chewy cereal bar, with enough peanut butter to hold you over until your next meal. I'm sort of surprised we haven't outgrown them. The Cripsy will surely kill him if we don't act soon. Cripsy? From the look of things, the gentleman has broken his neck and is already dead. In a medium-large mixing bowl, combine cereals and salt. Crunch and smash with your hands so the flakes are broken down into smaller pieces. In a a medium saucepan, combine sugar and corn syrup. Stir over medium heat until the sugar is dissolved. Turn off heat and add peanut butter and vanilla. Stir well to combine. Pour over cereals and stir. Transfer to the prepared baking pan and press down, using a piece of waxed or parchment paper, to distribute evenly. Refrigerate or let cool at room temperature for an hour or so. Turn out onto a cutting board and cut into 1-inch wide strips. Cut into one-inch squares. Can be stored in a ziploc bag or covered container at room temperature, or in the fridge, but they're really hard to chew when cold. * If you use a processed PB (Jif, Skippy, etc) make sure to cut the amount of sugar in half, down to 1/4 cup. Whole Foods no longer carries the waxed paper sandwich bags I've been using for the past few years. They switched to the "If You Care" line which doesn't produce a waxed bag. I can't even say the brand name without rolling my eyes. 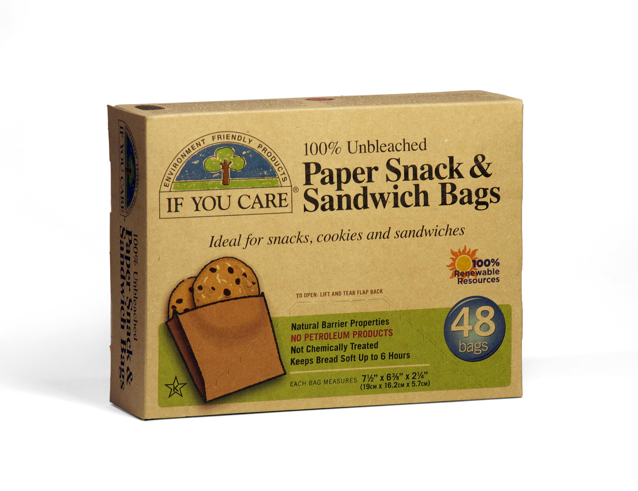 Anyway, the IYC product is a greaseproof paper sandwich bag, not waxed paper. It does the job, but I don't care. I liked the the old waxed paper bags, pictured at the end of the post. Natural Value waxed bags (the ones I prefer but can no longer source locally) are much lighter weight (used less paper) so you could fold over the top and a few times and the crease - and the sandwich or cookies therein - would stay put. I liked that there were more to a box (60 in the Natural Value box, and 48 in the If You Care). It's important to care about unit price, and it's important to care about paper weight and it's important to care about costs of transport - the one thing giving me pause about ordering a case of the Natural Value bags from Amazon at $2.99 a box. But if I placed that order I'd have to reconcile the true cost of the shipping box, tape, the fuel needed for the airplane and big, brown truck to deliver it (while idling, curbside) to my front door. Too many caveats for this emptor! 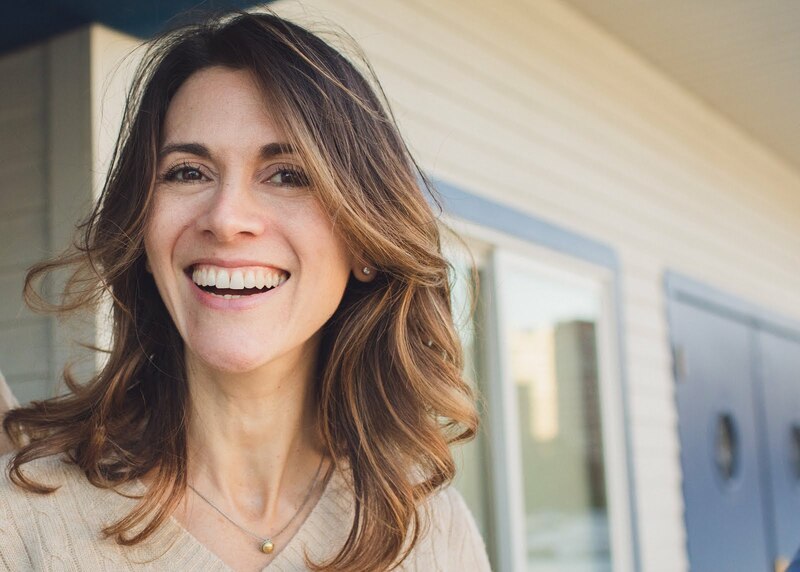 How does one make responsible shopping selections with so many factors to consider? I learned this some time ago: shopping at Whole Foods doesn't make me particularly environmentally-friendly. In fact, WF tries to impart the false sense that I'm doing my part just by being there and that is just plain sneaky. The WF produce section is stocked with items sourced around the world. Its carbon footprint dwarfs the Jolly Green Giant's. A produce-run to my local WF leaves me with fossil-fuels all over my hands (and possibly norovirus, to boot, given my disease-ridden reusable grocery sacks). Lady Pinch is unpacking a Whole Foods grocery bag when the doorbell rings. farmed salmon from Norway, avocados from Chile. Lo! There's the door. Who goes there? You gotta sign for this. Hands over a case of waxed paper bags and a Delivery Information Acquisition Device. More freight from lands afar! Slams door, and skips merrily back to the pantry to unpack the case of sandwich bags. The thing is, I do consider the toxicity of my consumables, but usually cut to the purchase following a fairly cursory review. I can be a horrible consumer. I like my old waxed paper bags. That doesn't make me more-environmentally-friendly-than-thou, just opinionated and overly concerned with the minutiae of lunch-packing. Click here to view the purchase I'm contemplating. What's in Your Grocery Bag? This was sent to me today. I had heard some rumblings about the unsanitary conditions of most reusable grocery bags. Every so often (yearly? ), I slosh a Chlorox wipe haphazardly around the interior of my insulated grocery bag. The rest of my maintenance routine involves (quarterly? biannually?) recycling of the stacks of paper receipts that accumulate in my reusable bags. Identifying the bacteria present on the inside of my grocery bags sounds like a great science fair experiment, except that it's likely too dangerous, given the risk of illness from contact with coliform bacteria. How then shall we bring home our groceries? Well, those stretchy cotton net bags would be a better alternative, as would cotton totes, since you can very easily stick them in the wash each week. But what are we trying for? To reduce waste or to appear sufficiently compliant with socially-mandated RRR practices? Personally, I really like recycling paper grocery sacks for gardening waste and as kitchen trash bags. I miss using them for student book covers. I'm not sure how to keep my bacterial footprint smaller than my carbon one, or which is more beneficial to my fellow man and our shared environment. Until I do, I'm going to have to roll up my sleeves, run a (half-full) tub of bleachy water, and wash my grocery bags. I'm not looking forward to it.